Dr. Jayvardhan Mishra is an Expert Neuro and manual Physiotherapist in Ahmedabad he is specialized into a cure-all types pain and paralysis dysfunction, in our body just in Maninagar area at Shraddha Physiotherapy Clinic & Rehabilitation Center Ahmedabad. He has also completed certificates courses of manual therapy and dry needling from Australia in 2006 and has cured more than 1,00,000 Patients in 10 years in Ahmedabad city now he can promise to give you relief in the first visit n get results in 1 week in all types pain. You can get the phone number of Dr. Jayvardhan Mishra (PT) on Kivihealth.com. Early rise in the morning. Do regular exercise for minimum 30 mints. Never use silver shild food product. Use sun light for vit d. Avoid prolong sitting or standing. And take more alkaline food. Will help you live fit n healthy. Nitesh my son is suffering from ADHD is of 11 years intially when I came to shraddha physiotherapy centre he use to only say one word repeatedly . Now he has started saying complete words and forming sentences also his understanding has increased. His weight has reduced a lot. he has started following all the instructions better than before his behaviour has improved. His overall health has improved due to Dr Mishra's excellent food supplements. Thanks to untiring efforts of Dr J.B Mishra. hello friends myself Darshna Shah 60 yrs Retd.nursing staff .sufring from chronic neck and shoulder pain since 3 yrs.i have consulted 4 orthopaedic doctors.but no any relief...after talking steroid injection & ozone inj. mild relief in my pain.one day m searching for a good Dr in Google than I saw the video of Dr j.b mishra.he is in maninagar .I came with my new hope and just after treatment session my pain reduced 80 % and just in 3 days i m living my Life pain free.. without taking any medicine. 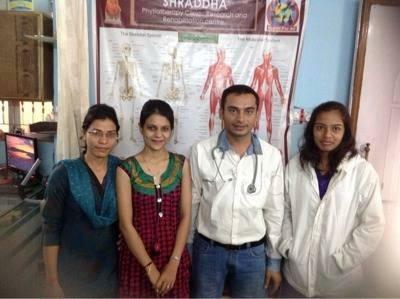 Thanks Dr mishra and whole shraddha team for his marvellous job may God bless him for his better success.